Oral hygiene is undeniably important, and we all need to make sure we're brushing our teeth properly. However, no matter how many YouTube videos, TV commercials, or weird lectures from your slightly scary dentist (just us?) you receive, it can be difficult to know how to do the job right. Our advice: let your toothbrush tell you. It is in your mouth, after all. 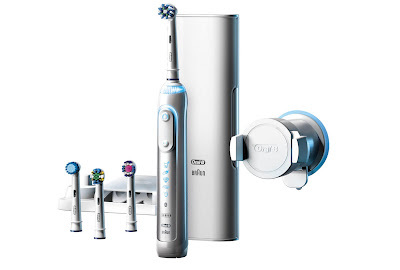 And so we check out the very smart Oral-B Genius 9000. This is an electric toothbrush. However, whereas as traditional electric toothbrushes merely vibrated and wiggled away inside your mouth, it seems like modern versions are capable of telling you exactly how to brush, and even how hard you are pressing. Our minds have been blown (but our teeth are really clean). 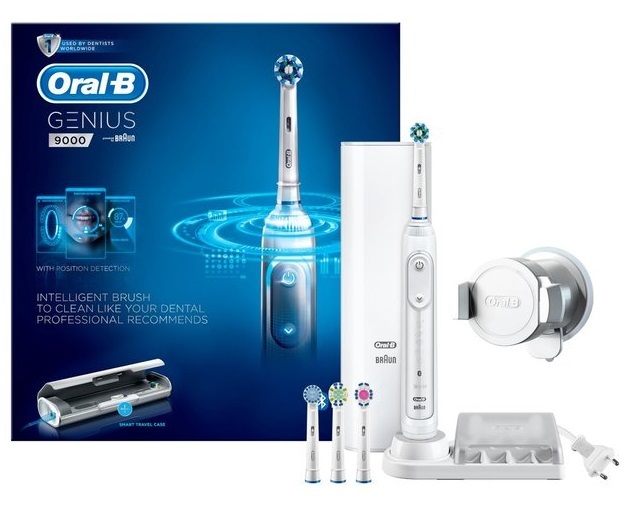 The Oral-B Genius 9000 Toothbrush set includes the main unit itself, three additional brushing heads, a hard carry/charging case, a brush head holder, and a smartphone stand. Everything sounds pretty conventional... with the exception of the phone stand, right? 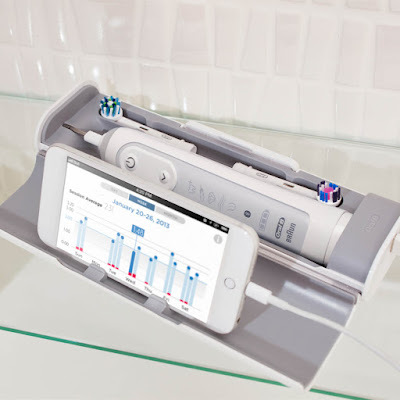 That is because the main selling point of the Oral-B Genius 9000 is not just that it knows what you're doing with it, but that it can connect via Bluetooth to your phone running the Oral-B app which displays even more information in real time. 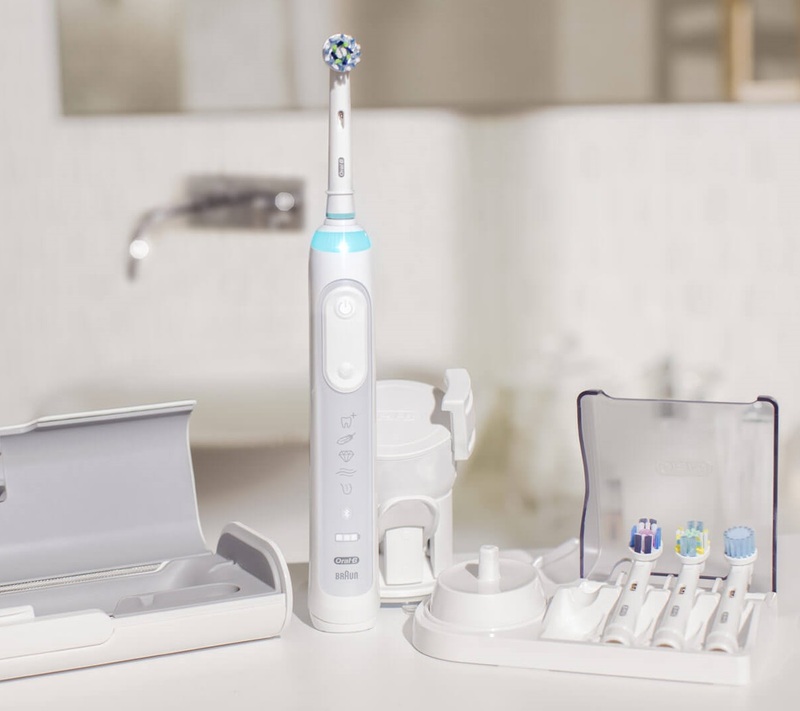 But first, the toothbrush itself: it is refreshingly slim for a gadget so completely packed with features, and light, too. It is comfortable to hold for long periods, and you certainly never feel like you're wielding a heavy mace while brushing. Oh, and you'll only ever hold it for two minutes at a time, anyway. And you'll know how long two minutes is because it will be displayed on your phone while you brush. The interchangeable heads come off easily enough, and as well as a unique multi-directional brush head, that felt like it was reaching parts of the teeth and gums but easily reached by normal brushing, our eyes we're also caught by the polishing head. Yes, you can give your teeth a polish once you've done cleaning. Fun! 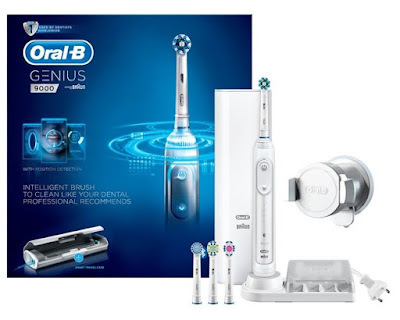 The Oral-B Genius 9000Toothbrush features a glowing ring at the top of the handle which will flash and pulse to communicate several different things (Bluetooth connection the most useful in our opinion). You can also use the app to set it to glow in one of 12 different colours, just to add a personal touch you to your brush. As well as the useful functionality, it just looks cool, too. The carry case is rigid and tough, closing securely around the brush. It features a groove to rest your phone in, too, so even if you're travelling and don't what to take the dedicated suction-cup stand, you'll still have a safe place to lean your phone while brushing. Just keep it clear of water, if you don't own a waterproof phone. So, in use, the Oral-BGenius 9000 feels great. For all the bells and whistles it is still possible just to switch it on and clean your teeth, and the resulting job feels very clean indeed. However, connecting to the app is definitely worth it, and not just for the on screen timer. 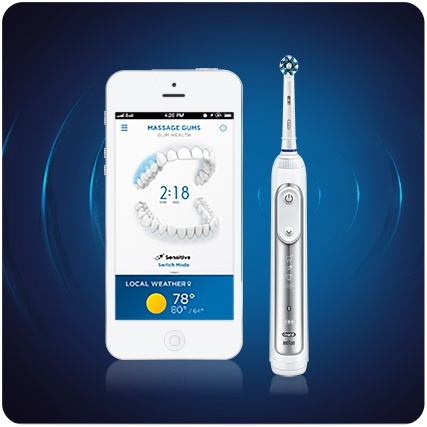 The app will walk you through all her areas of your mouth you need to visit, so you'll never miss a certain spot out. It will also display warnings in case you apply too much pressure, as this can lead to gum damage. We discovered there were entire parts of our mouths that we we were simply never brushing; like seriously, every one of us that tried. Even those who prided themselves on pristine oral hygiene learnt a thing or two about technique and timing. And, after a few days, our teeth definitely seemed cleaner and brighter. Yes, it is quite a lot for a toothbrush, but the benefits really seem to make it worthwhile. 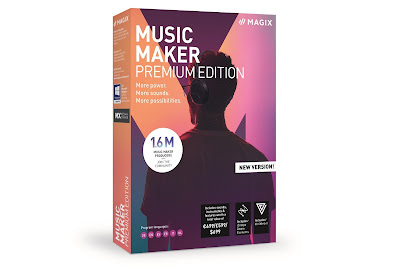 Plus, as you can swap out the heads, you could always buy it for the whole family to use. Just a suggestion.